Shattered and battered: Ponnappan and Radhamony whiling away their time in what is left of their home. Water is yet to recede from the courtyard. In the dark of the night, when green Kuttanad transforms into clusters of luminous dots on water, a small country boat from the Kainakary panchayat begins its cruise on an easterly course. On it is a family of three, with a couple of vessels, a lantern and cattlefeed. Their destination is a two-storey house, away from the water, away from the flood, where they would spend the night. In the wee hours of the morning, they would wake up and go find their cow Paru on the high ground where she is tied. They feed her and milk her—their only source of income now. The other, the paddy farms—that Kuttanad is famous for—have been inundated as the bunds breached one after the other. It is not the snakes—brought down by the floodwaters—that force them to take this journey to safer shores every night. It is the fear that their submerged house, now cleaned, would collapse in on them while they sleep. They knew that they would not sleep there anymore. “I asked the people in the two-storey house if we could spend the night on the verandah but they asked us in,” said Radhamony. Her house was cleaned of silt and mud by volunteers who had swung into action as part of a massive cleaning drive by the government. Outside, there is still the muddy waters refusing to yield. Inside, you trip on a number of concrete bricks. “We had piled them to keep the furniture and cots raised and had stacked everything precious on the top,” said Radhamony. But the plywood sheets on the cot had decayed and the clothes, even those that were kept in plastic covers, were shredded. A leather suitcase that someone from the ‘Gulf’ gifted lay molded on the frames of the cot. The concrete slabs in the kitchen had given away in part, while the utensils and plates lay rusted and perforated. So was the cast iron coconut dehusker. The mixer grinder had floated away. The television is being dried, but hopes of it working are faint. Akhil’s cricket bat, however, looked good. Akhil, a plus two student at the SNDP secondary school, Kainakary, managed to save all his books at home, but his school continues to be under water. “I go to a different school now,” he says. “They have agreed to let all of us attend classes there until the water recedes from our school.” A science student, Akhil seemed a little apprehensive about missing his practical classes. The time-table and teaching schedules have all gone awry in most schools in the flood-affected areas, making it all the more difficult for students in class 10 and class 12, who have to write board exams in less than six months. 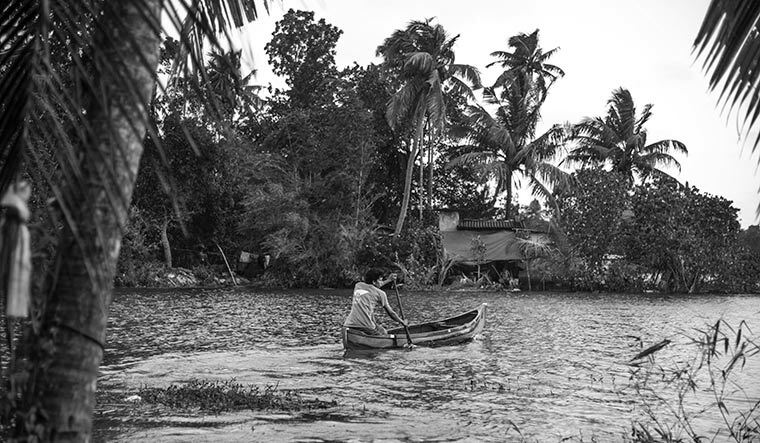 Drifting along: Boats remain the only mode of transporation for Akhil and his family, as their home is cut off by floodwaters. Radhamony’s is just one of the houses that bore the brunt of flood fury in ward number 14 of the Kainakary panchayat. Such examples abound in worst-hit districts of Pathanamthitta, Thrissur and Ernakulam, too. If it is Radhamony and family in Kuttanad, it is Lekha, a widow and her two little children, Akhilesh and Akila, in Ranni, who have to sleep elsewhere for fear of their house collapsing on them. Asha and her paralysed husband in Aluva lost their house when a tree fell on it during the heavy rain. High up on the hills in Cheruthoni in Idukki, is Fakhrudeen, a shaken man. His shop, and two others, were the only ones that landslides on either side spared. To his right, two houses collapsed. Ravi, the owner of one, managed to get his children out just in time, while the four in the neighbourhood were not so lucky. 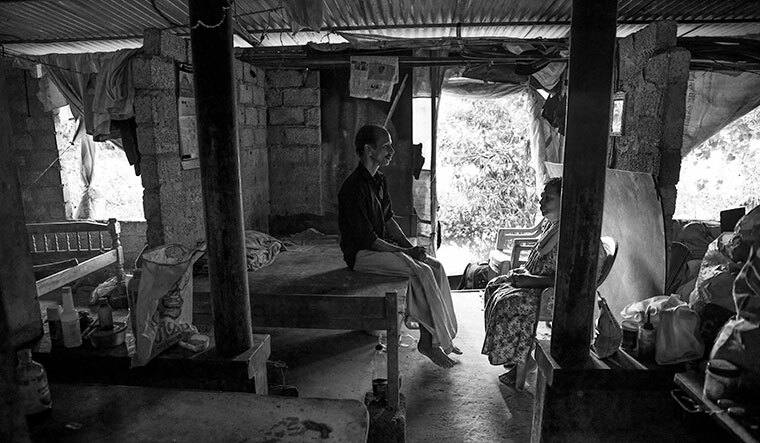 Ravi’s family is just one among the hundreds displaced in Idukki. The ecologically fragile Idukki and Wayanad districts have seen the maximum number of landslides, and therefore the maximum number of houses destroyed. A large number of houses that managed to escape the wrath of the rivers and the earth have cracks like Radhamony’s has. The displaced, across the state, have had to face harsher realities after a week or two in relief camps that were marked with an unexpected and amazing kinship. While the requirement for food, clothing and medicines are being taken care of by humongous support from within and outside the state, the other basic need of shelter, and that too for so many, remains a question mark. The total number of houses completely destroyed is estimated to be 7,000 and the number of partially destroyed ones, a whopping 50,000. The government decision to assess damages to houses before fixing the compensation package, many feel, is delaying the process. ‘Rebuilding better’ being an important aspect of rebuilding post disasters, the government has to take care of not making the same mistakes all over again. “No one will be allowed to rebuild on landslide-prone areas. They will retain the land, but construction will not be allowed there,” said Isaac. The government has announced Rs 4 lakh per house that was lost in the floods and a compensation of Rs 10 lakh for those who lost land and house. But, while the official machinery is taking its time at raising and disbursing funds for restoring and rebuilding the state, the thousands who have lost shelter are moving into a phase of post traumatic stress and depression. While the complaints pour in over the delay in government support, there are members of small WhatsApp groups from several parts of the world who are willing to chip in their time, knowledge and money for the micro-level rebuilding of the state, providing solace to a tiny percentage of the homeless. However, the larger rebuilding, apart from roads, bridges and other infrastructure, might make the homeless people older by a few years at least.